One of the best ways of seeing the best of Ibiza is by sea. Miles of stunning coastline are just waiting to be explored. So, to make the most of staying on this wonderful island why not take a cruise and visit the multitude of beautiful places on the Ibizan coastline. This superb luxury Yacht is available for private crewed yacht charters and day cruises in the Balearic Islands. Harboured at the marina in Sta Eulalia on the east coast of the beautiful island of Ibiza - a twinkling gem in the Mediterranean, with a gentle, rural landscape dotted with olive and almond trees, simple whitewashed houses and fortified churches. Aboard, you can experience the sheer, unashamed luxury and self-indulgence of the jet-set life for a day! We crew the yacht for you, so all you have to do is to arrive at the marina in St Eulalia, come aboard, and relax for a fabulous day of seeing how the other half live. 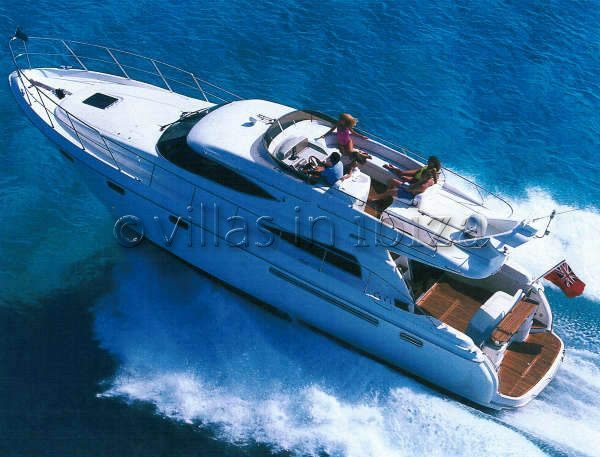 Examples of day cruises are a trip to the paradise island of Formentera, passing the magnificent Ibiza coastline en-route and taking in the views of Ibiza Town and the fortress of Dalt Villa; a cruise around the beautiful island of Ibiza or watch the sun go down at one of Ibiza's idyllic locations on a sunset cruise.